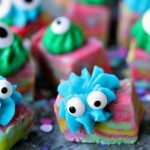 Easy microwave fudge swirled with fun colours, topped with icing and transformed into cute little monsters! I’m a bad food blogger. I have yet to jump on the Halloween recipe bandwagon this year. Until today. So I figured if you’re going to do a thing, do it just a little bit different. I opted not to use orange or black for the fudge. Instead I went with bright colours. You could do this with orange, or with black. Whatever floats your Halloween boat. I just like cute colours. It’s the girl in me. I have a thing for cute food. I have a thing for tiny food. So I combined my two loves and made each slice a cutie-patootie little monster. I know. It’s ridiculously silly, and slightly adorable. It’s how I roll. Halloween gets the cute treatment around the Beaulieu compound. 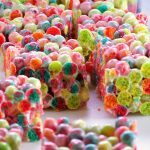 So you can find the recipe for this cutie-patootie fudge over at Real Housemoms. I’m a monthly contributor over at Aubrey’s pad. 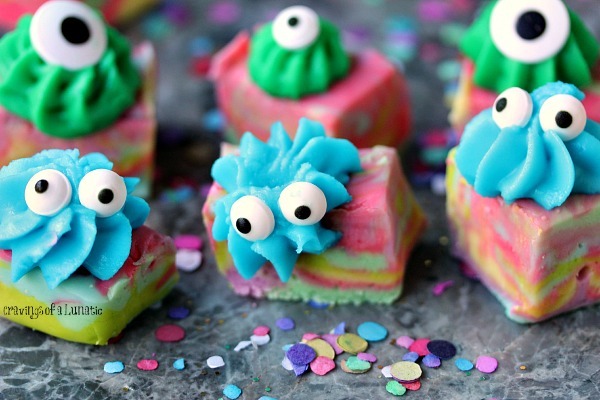 So zip on over there to grab the recipe for this Easy Monster Fudge. The first thing you want to do is decide how many colours you want to use. Set the food colouring on the counter. Once you decide how many colours you want to use, you can set aside the same amount of small dishes/jars for mixing each individual colour. Set those aside. Line a small pan with parchment paper, then spray with non-stick spray. Set aside. In a large microwave safe bowl or measuring cup combine the white chocolate and sweetened condensed milk. Pop the bowl in the microwave for 1 minute, remove and stir, then pop back in for another 1 to 2 minutes, checking it every 30 seconds. Everyone's microwave is different so be sure to check every 30 seconds. It's done when the white chocolate melts smoothly into the sweetened condensed milk. It should be slightly thick, not runny. Do not over cook it. Remove from the microwave and pour a little in each jar you set aside earlier. Now add 1 to 2 drops of one colour in each jar. Use a popsicle stick to mix. Add the confectioners sugar equally into each jar, mix again. Now you want to randomly drop each colour of fudge mixture into the pan. There's no rhyme or reason to it. Just drop colours here and there and keep layering them. Once they are layered you can take a toothpick or blunt edge of a knife and drag it through to make swirls or designs. Place the fudge in the fridge for about 4 hours minimum, or overnight. Remove from fridge and slice the fudge into small squares. Place googly eyes on each piece randomly. 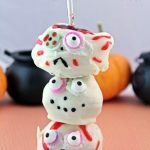 Craving More Halloween Recipes? Check these out! 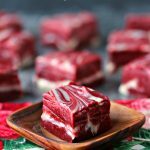 Craving More Fudge Recipes? Check these out! PIN THIS TO YOUR FAVOURITE HALLOWEEN RECIPE BOARD! 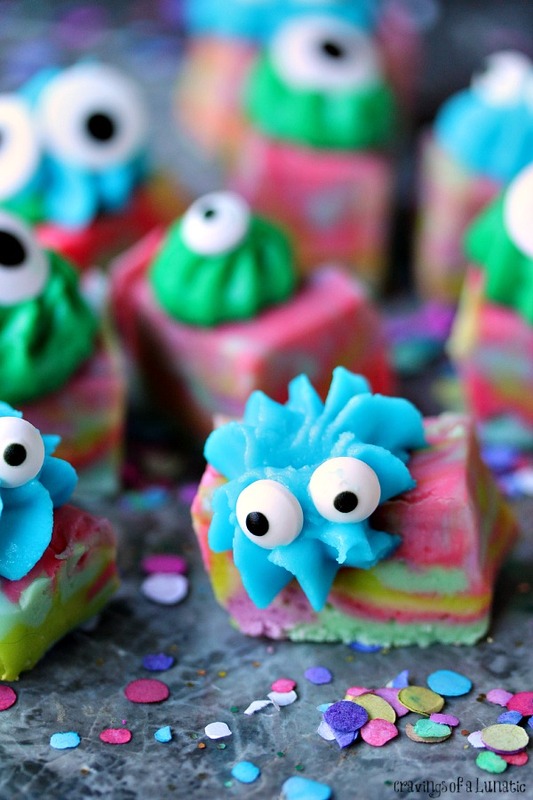 Want more Monster Fudge? Check out this Monster Fudge! Wondering where I’ve been? I’ll fill you in on the latest and greatest news this coming week. There are recipes coming up for Chocolate Hot Cross Buns, and a long overdue post for a Trix Ice Cream Cake I made in the summer. Sorry. Told ya, bad food blogger. See you soon. Happy Halloween! Check out my recipe index for more amazing recipes. 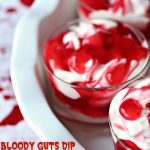 You can find more halloween recipes and tons of candy recipes. I also enjoy tiny food. Because you can eat more of it. Exactly. We were separated at birth, I swear. 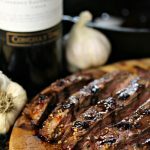 Bad food blogger, great recipe developer! This looks terrific. Looking forward to hearing what you’ve been up to. Kim, you crack me up! Little food IS cute huh? I like to make small ’cause my co workers think I made a bigger fuss! Love that too! These are adorable, and I’m holding out for those chocolate hot cross buns! oh my gawd, Kim!!! I love this monster fudge!!! so cute!! I need to make this! heading over now for the recipe! You may not have jumped on the Halloween bandwagon but you totally made up for it with these litle monsters!! muhahaha I love them so much! I love the deviation from the traditional orange and black! This is so cute and colorful! I love cute, tiny food too! And I don’t really do the whole cutesy halloween food either. Maybe I’m a bad blogger but it’s just not my thing! This fudge though? I am totally down! Cutest fudge ever. My kids would flip over this. Oh my goodness!!! I adore this! These are so festive and colorful! These are the cutest little monsters ever! I’d make these year-round! These are some of the cutest Halloween treat I’ve seen this year. What a great idea! I am in love with this fudge! Your colors are just amazing! Ha. When I saw the title “monster” I assumed it was going to m&m’s and all things that go into monster cookies. I was so happily surprised at these cute little nuggets of deliciousness. I love these, truly. These little creatures and delightful. I am smiling as I am typing. I seeeeeee youuuuuuuu! These are absolutely adorable! I was never a fan of orange and black myself. I am all for cute colors as well! These are such a fun and cute idea! Cutie patootie is right! Those are so adorable I don’t know that I’d be able to eat them. Gah! This is so adorable! Heading over for the recipe! These are adorable! So cute!!!! I love tiny food! These monsters are SO CUTE. Seriously Kim. 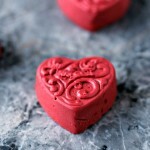 These are amazing and so so creative and I bet they taste just as good as they look. Kim, these are really too cute! 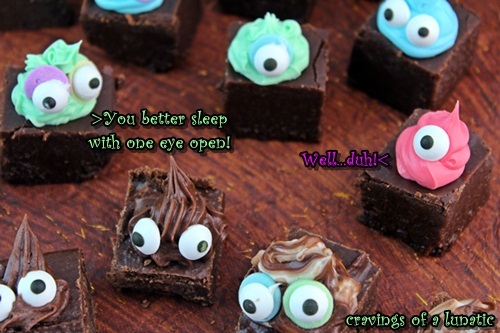 I love the use of oogly, googly eyes… which is what I have re-named the fun candy eyeballs. These are adorable! I love monsters so I fell in love right away looking at them! Hooligan Mama, you are the Master of Miniatures. Somehow I think small, individual or even bite-sized somehow implies portion control. Not for me―I’m usually on a path to serious satiation, so tiny doesn’t mean less, it’s license for MORE. BTW, I love your colorful interp of Halloween spirit! So cute! Perfect for kids! !